So, the Big Six Wheel, also known as the Wheel of Fortune, Money Wheel and many others but less famous is also a game of chance. As well as the roulette game Big Six Wheel is the one, where it is difficult to win. Let us think, how can we adjust the roulette wheel to the Wheel of Fortune? And is there sense in doing that? 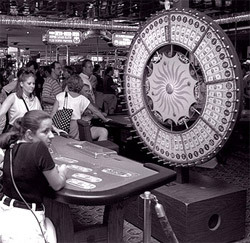 So, as there are many legends about the roulette game origin, the Big Six Wheel also has one. But it is not about the Romans, it is about the Greeks. Those Greeks, who invented the game, were also soldiers. Actually, it is better and right to think that the legend has two tellers. Back to the ancient Greeks. They were playing an ancient variant of the roulette game. They took a shield, marked sections on it and spinned on a spear. The soldiers placed the bets and whoever won, took all the placed bets. Also it was some kind of settling the arguments between the soldiers. If there were some difficulties in an issue solution, they would also turn to the "fortune judge." So, how did it work? They would take a wheel of the chariot and mark the sections (as many parts, as there were people in dispute). Then they took a spear and drove it into the ground. After they spinned the wheel. When the wheel stopped, whoever's mark was closer to the spear, was considered a winner and was let go without any further argument. But that was in ancient Greece, where people were mostly noble and polite. Actually, that is what the history books tell us. But I suppose that we can believe it. The painful truth of the resent days tells us that we should not play the Big Six Wheel. You ask why? Well, it happened historically that this game brings the player less benefit than the usual European or American roulette. You will be astonished when you learn that the house edge varies from 11 to 24 percent in different casinos (now, do you remember that it is only 5.26 % in the American roulette). The game has 54 slots, which is way more than our home roulette (it is either 37 or 38 slots in the home one). The usual Wheel of Fortune is set up vertically but you can adjust it as you like it. At first glance, it seems that it is useless to adjust your home roulette wheel to this game but you can vary it. You can have the same quantity of slots at the wheel you want. As the Big Six Wheel has $1, $2, $5, $10 and $20 slots and one Joker and a "Casino Logo." You can replace the "Casino Logo" by any other thing you want. Also you can substitute the dollar bets by other bets, like desires to make or some kind of forfeits. Check out Kolo Fortuny and Le Multicolore for comaprison.